Fantastical, Flexibits' excellent calendar client and one of my favorite iOS apps, is launching on Apple Watch today with version 2.3 of Fantastical for iPhone. Fantastical for Apple Watch has a few limitations due to the nature of WatchKit, but Flexibits put a lot of thought into several details of the app, using the device's voice input and brief interactions to refine the experience. 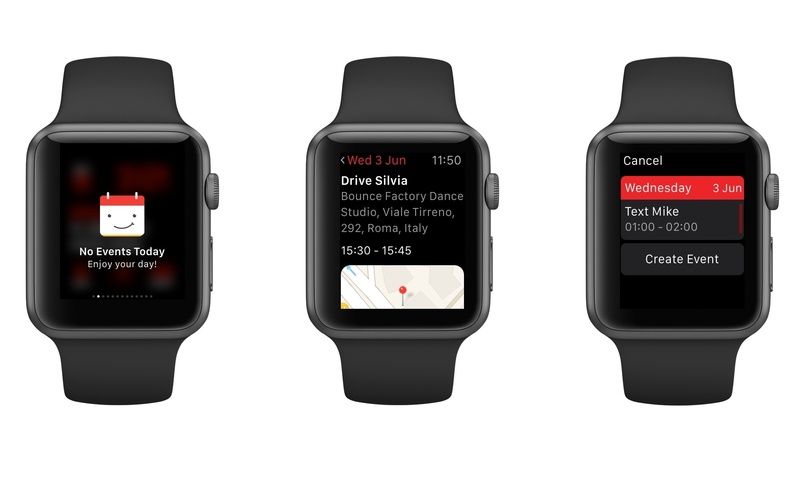 On Apple Watch, Fantastical lets you view events, create new ones with Siri, and get directions for events that contain an address. The main app is a list of events and reminders – the same one that you get on your iPhone. Unlike Apple's Calendar app for the Watch, Fantastical doesn't have a month view, but its unified list can show reminders and events simultaneously (which isn't possible with Apple's apps as the company doesn't even have a Reminders app for the Watch). Events are color-coded, and, because of the lack of a month view, Fantastical shows a week's worth of events with the current date displayed at the top. A nice touch in Fantastical is that, like on the iPhone, it shows an embedded Maps preview on events that contain a location. Just like David Smith's Take Me There, you can tap on these inline previews to open directions in the Maps app for the Watch – again, a feature that isn't available in the native Calendar app and that makes Fantastical a superior choice for those who often view several location-based events. 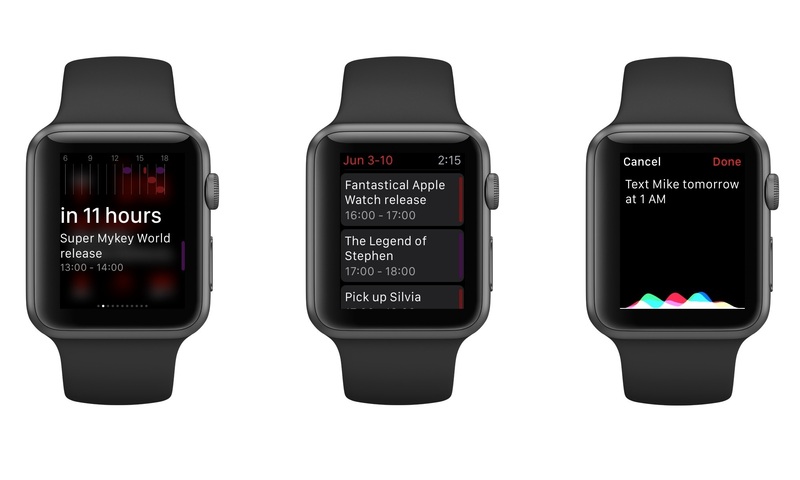 In bringing Fantastical to the Watch, Flexibits kept the app's marquee feature – natural language input – and revised it with the ability to create new events just by speaking commands to Siri. Any time you want to create an event in Fantastical, press firmly on the screen, tap Add Event, and start talking; Fantastical will then recognize relevant event information such as dates, times, and locations like it can on iOS, and it'll create a new event directly on the Watch. Obviously, the event creation screen on the Watch doesn't have the full functionality of the iPhone app, but for a slimmed down experience that's solely focused on dictation and returning to what you were doing, the Apple Watch app works fairly well. Left: Fantastical's glance is happy when you're not busy. Right: Myke won't be happy with Siri dictation. Sorry, Myke. The Fantastical glance is my favorite feature of the app on Apple Watch. In a single screen, Flexibits has reconstructed a smaller DayTicker as a horizontal bar for the next 12 hours with upcoming events displayed as colored blocks as long as their duration (like on the iPhone). In the middle of the screen, the glance shows when the next event is going to be in plain English, what it is, and which calendar it belongs to. Like the Todoist glance, I'm a fan of the actionable approach taken by Fantastical on the Watch: instead of showing me a list of all events in my calendar with text so small I can't read, it only shows the next item at a glance so I can instantly know what's coming up. Flexibits isn't new to packing tons of information in small screens without cluttering the interface, and this glance is another example of their expertise. My only negative note about the app has nothing to do with Fantastical itself and it's related to performance. Fantastical can be slow to load like any other WatchKit app, and until Apple offers a native SDK, there isn't much Flexibits can do to address these issues. Fantastical may lack the integrations and custom keyboard found in Sunrise, but its elegant interface and natural language support are still unparalleled. The Watch app isn't revolutionary today, but it's a useful companion to quickly dictate new events and see what's coming up at a glance. I can't wait to see what Flexibits does with a native Watch SDK later this year. Fantastical 2.3 will be available on the App Store today.